Tiffany Baker is a wonderful writer. These responses to questions sent to her via email reveal an honest and articulate woman who truly appreciates the accolades her first book is earning. Here, she talks about creating and conjuring and contemplating. Interviewer Steven Rosen: Once you had your story, how difficult was it finding the words? Did you go over every word you wrote? Was every word/adjective/verb scrutinized? Tiffany Baker: Finding the words wasn’t hard, but finding the perfect point of view and plot was! Early on, I revised the novel and put it in Truly’s voice, and that’s when it started to sing. Then I tinkered with the plot, adding more detail about the quilt, making Amelia much more a part of the story. In the end, though, I always come back to the language and the music of the words, so, yes, I really do go over every, single word! When you're compared to John Irving or Anne Tyler, how does that feel? Were you a fan of John Irving? It’s an honor. I’ve been reading both of them since I was a teenager. I love the fact that both Tyler and Irving have distinctive themes and motifs that they return to again and again in their work, and I love the attention they pay to setting. Also, Anne Tyler has this brilliant essay called “Still Just Writing” about what it’s like to try to balance motherhood with writing novels. Now that I have kids, I know what she’s talking about! Was any one character more or less difficult to write than the others? Truly’s voice really did just come to me out of the air, like when you’re tuning a radio and you catch an unexpected station. She was so much fun to write. I took more time getting the older Bobbie just right. In one draft, I had him running off to New York, but I decided he’s more of a homebody in the end. Is there any particular passage that strikes you as being your best work? Hopefully, my best work is still ahead of me! Can you talk briefly about your second book? It’s the story of three women living on a salt farm, and they all have a history with the same man. Two of the women are sisters, so I’m exploring that relationship again, but this book is about making a deal with the devil and then having to live with those consequences. Tiffany Baker lives in Tiburon, California with her husband and three children. This is her first novel. For more on the author and her books, visit her website at www.tiffanybaker.com. 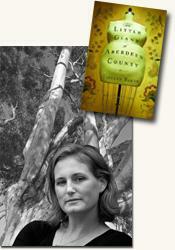 Journalist Steven Rosen interviewed author Tiffany Baker, author of The Little Giant of Aberdeen County (see accompanying review), about her book for curledup.com. Steven Rosen/2009.